in transverse creases & dermatoglyphic main lines! 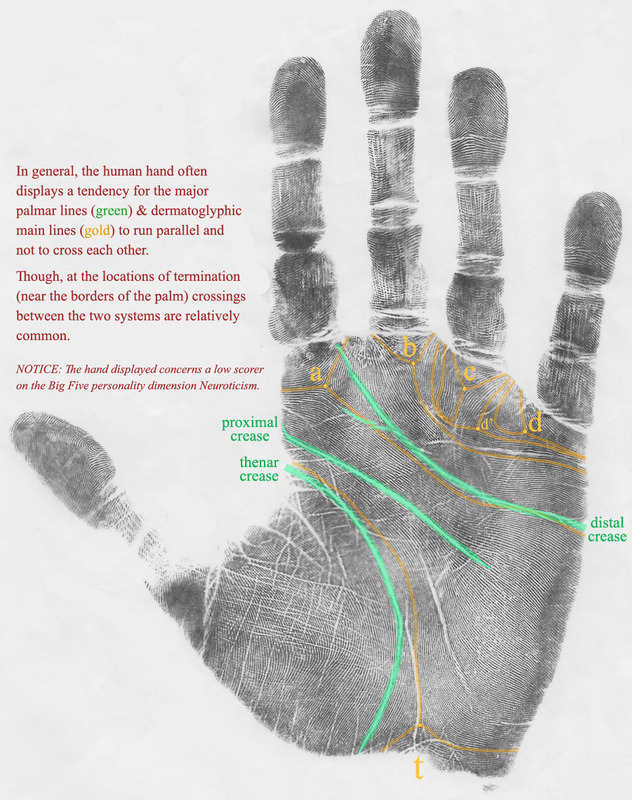 The human hand typically displays an oblique system of transverse creases & dermatoglyphic main lines which tend to run parallel to each other. New findings are reported here which suggests that 'crossing systems' are more common in high scorers on the Big Five personality dimension Neuroticism; a set of three crossing-constellations is presented which reflect the path of the major transverse creases and the dermatoglyphic main lines. Additionally, the significance of four other constellations is described involving a high axial triradius combined with variations in the three major primary creases. The reported findings provide a deeper understanding of how the Big Five personality dimension Neuroticism can be recognized to manifest in the hand. The results indicate that 13 out of 34 Neuroticism high scorers (= 38,24%) show a distinctive constellation involving the dermatoglyphics & major primary creases of the hand; the constellations are not present in the hands of 41 Neuroticism low scorers. Interestingly, the findings reported here appear to share a variety of similarities with a group of syndromes that is associated e.g with 3 factors: low muscle strength, heart disease + crossing-constellations inside the hand; after earlier studies had suggests that the first two factors correlate with Neuroticism, the new reports now suggests that all 3 factors are associated with Neuroticism. the major transverse creases & the dermatoglyphic main lines. & dermatoglyphic main lines a, b & t.
In the summer of 2015 a preceeding report described how various aspects of the primary creases & the dermatoglyphics correlate with the Big Five dimension Neuroticism. In this report the attention is focussed on a fundemantal issue involving the combination of the ulnar termination of the distal crease (a.k.a. the 'heart line') and the path of the dermatoglyphic path of the dermatoglyphic main lines a, b & t.
In this perspective three 'crossing' constellations have been identified; results for the individual constellations are presented inside the table below; the picture displayed below the table describes the details involved with each of the individual constellations. & the dermatoglyphic main lines (high resolution picture available HERE). 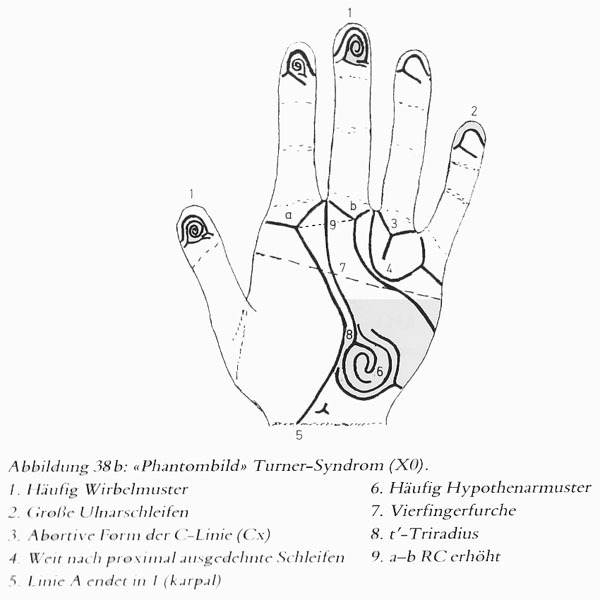 • NORMAL constellation: Often there are few signs of crossings between the systems involving the palmar creases & dermatoglyphic main lines (only main line a, b & t need to be taken in consideration); main line t is very often inclined to cross the proximal transverse crease (a.k.a. head line), and the distal transverse crease (a.k.a. heart line) usually curves upward before reaching the zone of the 4th metacarpal phalange. 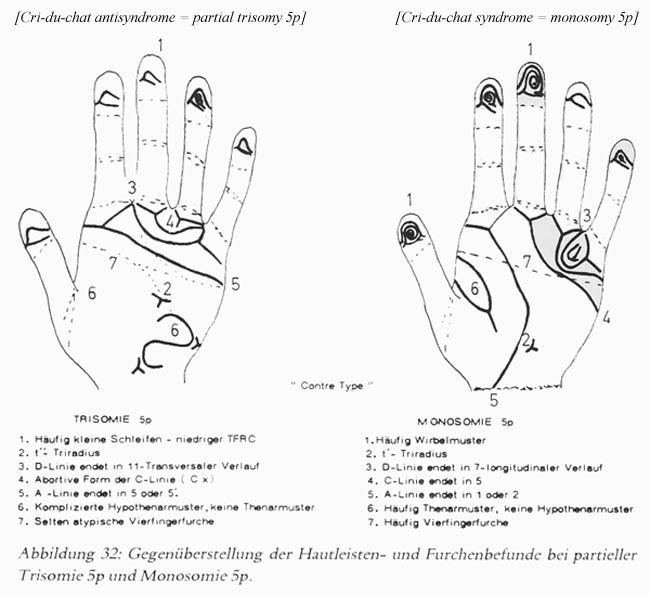 • SYNDROMATIC constellation*: Hand charts for various syndromes show a constellation of crossing systems involving the palmar transverse creases & dermatoglyphic main lines; the constellation is featured with a simian crease which is crossed by main line a, b & t combined with a high positioned axial triradius (t"). • NEUROTIC constellation ATB: Main lines a & t cross the proximal crease with a radial ending for main line a, plus main line b crosses a low positioned distal crease (which does not curve above RU before the 4th metacarpal). • NEUROTIC constellation AT: Main lines a & t cross the proximal crease with a radial ending for main line a, combined with the presence of a low positioned distal crease (which does not curve above RU before the 4th metacarpal). • NEUROTIC constellation AB: Main line a crosses the proximal crease & main line b crosses a low positioned distal crease (which does not curve above RU before the 4th metacarpal); main line t is normal. * NOTICE: The 'SYNDROMATIC constellation' is common in e.g. arthrogryposis, Turner syndrome & cri-du chat syndrome, which all involve muscle-control problems (+ heart defects); hand charts for each of these syndromes are presented below, each chart displays features very similar to the 'SYNDROMATIC constellation'! Beyond the issue of the 'crossing-constellations', there is another fascinating element inside the SYNDROMIC constellation: the high positioned axial triradius t" - which is found in the (radial) upper half of the hypothenar zone - a.k.a. 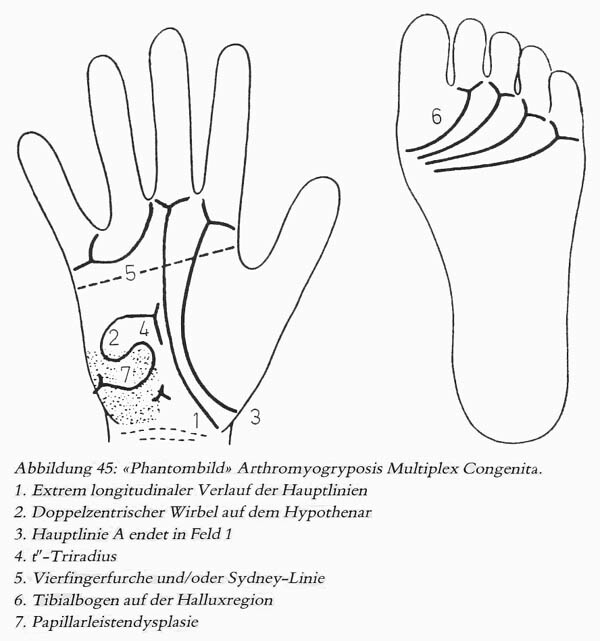 mount of moon in the field of palmistry (high located triradii featured with a radial hypothenar loop are excluded). Interestingly, the high positioned axial triradius t" found in 6 out of 34 Neuroticism high scorers (involving 9 hands in total) is featured with at least one less common variation involving the three major primary creases. The four constellations involve: I - a simian crease (2 subjects, 2 hands in total); II - a large interruption in one of the primary creases (3 subjects, 3 hands in total); III - a twin-line (5 subjects, 5 hands in total) - a 'twin-line' can be described to represent a dissociated remnant of a splitting head line; IV - a dissociated head line (3 subjects, 4 hands in total). One of the 6 Neuroticism high scorers also has one of the 'crossing' constellations described in the preceeding paragraph. Additionally, though the high positioned axial triradius is found in 5 out of 41 Neuroticism low scorers (involving 8 hands in total), however, it's presence is not featured with any of the four primary crease variations. Therefore, the combination of a high axial triradius featured with at least one of the four described variations in the three major primary creases also appears to represent a significant clue in the perspective of the Big Five personality dimension Neuroticism - the variations are displayed in the picture below. (High resolution picture available HERE). NOTICE: Especially the combination of a high positioned axial triradius plus a simian line is strongly associated with the so-called trisomy-syndromes (e.g. Down syndrome, Edwards syndrome, Patau syndrome & Warkany syndrome), but high prevalence for this combination is also found in many other syndromes - which explains why this combination is featured in many scientific hand charts. The reported findings provide a deeper understanding of how the Big Five personality dimension Neuroticism can be recognized to manifest in the hand. 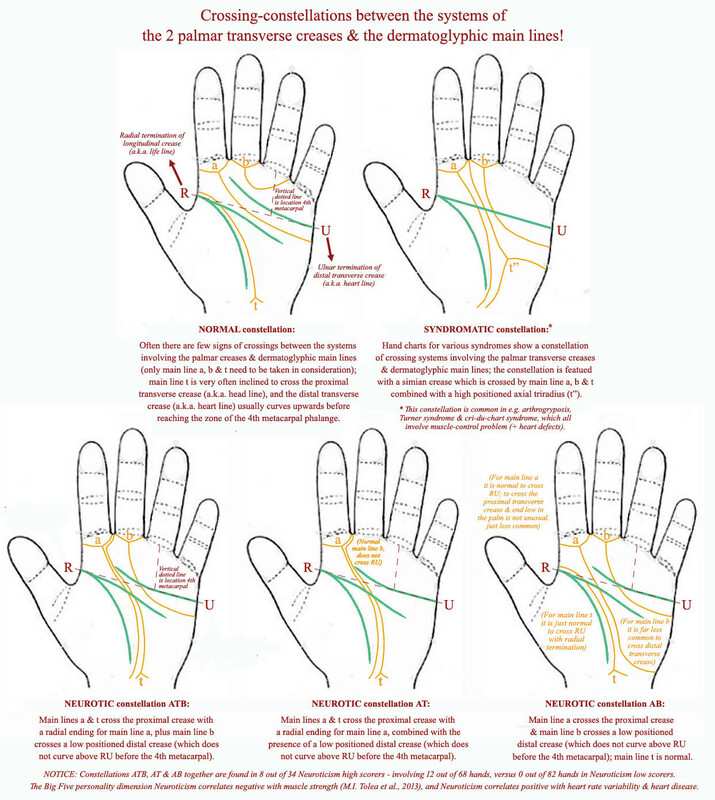 The results indicate that the typical tendency for the human hand to show an 'oblique' system of primary transverse creases & dermatoglyphic main lines that run parallel to each other, is often not present in the hands of high scorers on the Big Five dimension Neuroticism. In all cases where a neurotic constellations has been identified it is present in the left hand; four cases also have it in the right hand - this makes sense in the perspective that the human hand is known to display "the tendency being for ridge courses to incline more to the transverse direction in the right hands" (Cummins & Midlo, 1943; p.174). Speculative, this result can be understood to represent a curiosity in the biological system - which appears to reflect an inefficiency in the muscle system (including the heart muscle) that results in an above average sensitity for stress(ors). Combined with the findings reported for the combination of a high positioned triradius + four variations in the three major primary creases, the results inside this article indicate that at least 13 out of 34 Neuroticism high scorers (= 38,24%) show a distinctive constellation involving the dermatoglyphics & major primary creases of the hand. Finally, to end with a curiosity: inside the classic work 'Finger Prints, Palms and Soles' a very rare pair of hands is presented - see picture below - featured with a "longitudinal ridge alignment" which has been associated to represent "an atavism", because in most monkey- & ape species the path of the dermatoglyphics usually displays a much more longitudinal direction than usually seen in the human hand (Cummins & Midlo, 1943; p.174). 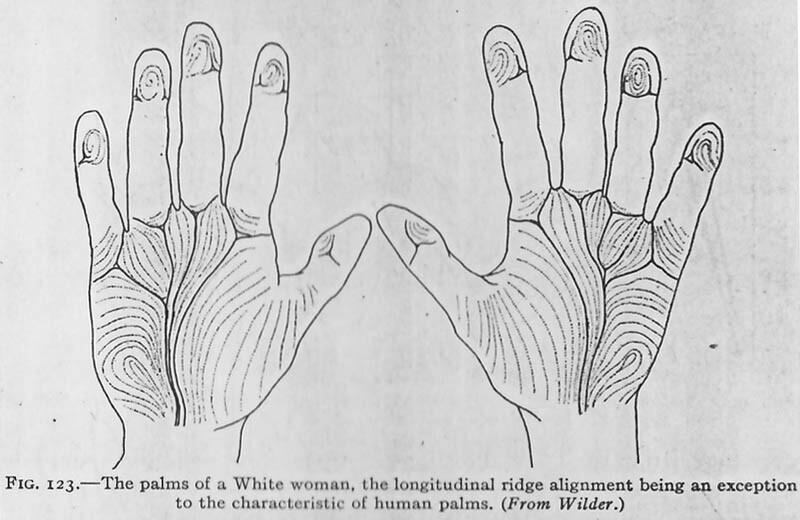 to the characteristic of human palms (Wilder, 1916).